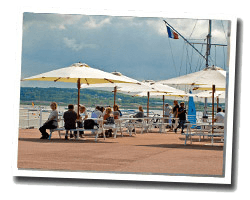 Pearl of the Côte d'Opale Le Touquet-Paris-Plage is located in a beautiful site at the mouth of the Canche river. At the seaside, you will find dunes that allow pleasant walks. The sandy beach long over 12 km hosts in summer many events. You can admire beautiful villas in Anglo-Norman style. 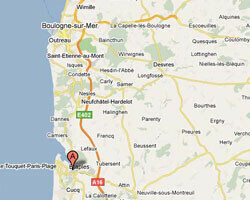 In Le Touquet enjoy a seaview holiday rental. Apartment 65sq. m on the 3rd floor (lift) - in the seafront with view of the beach of Le Touquet. open kitchen. sep.WC. west facing balcony with outdoor furniture. no smoking. 3 Bedroom(s), 3 double bed(s). Final cleaning : 40 €. Seafront Apartment , 40 sq. m, floor 8, 2 rooms , large panoramic sea view , Double balcony with deck chairs. apartment 30sq. m -seafront; very clear, large Sea view;50m from the beach. house linen to rent. 0 Bedroom(s), 1 double bed(s). Final cleaning : 30 €. New, bright apartment 55sq. m on the 6th floor. Two balconies. Bedroom and box room; sleeps six. 1 Bedroom(s), 2 double bed(s). short stays possibility. Final cleaning : 50 €. 3 rooms apartment 65sq. m in a residence with lift. balcony with outdoor furniture. Shops at 150m. 3 Bedroom(s), 3 double bed(s). short stays possibility. Final cleaning : 40 €. floor 6 of a residence, Facing the sea, balcony with deck chairs. 2 Bedroom(s), 2 double bed(s). Final cleaning : 30 €. L'Assiette Anglaise is an apartment located in Le Touquet-Paris-Plage, 100 meters from the Aqualud water park. You will enjoy a balcony and a beautiful view of the beach. Price from 1155 € to 1400 €. Apartment for 4 people located at Le Touquet-Paris-Plage, 400 meters from the Aqualud water park, L'eau Vive has a balcony with sea views. Price from 1260 € to 1610 €.